Burnley are continuing to monitor Michael Keane ahead of Saturday's trip to Bolton Wanderers. 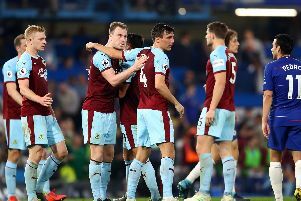 Keane had played every minute of the Clarets' Championship campaign this season before to the head forced him off just after the half hour at home to Rotherham last Saturday. James Tarkowski came on for his debut, and he made his first start against Nottingham Forest on Tuesday night, with Keane ruled out for a minimum six days under FA protocols. In terms of the squad as a whole, Dyche said: "Duffo's (Michael Duff) just got back on the grass, Deano (Dean Marney) has had a few days' training with us now - he won't figure but he's getting back now. "Barnesy (Ashley Barnes) is back with us and we'll be looking to edge him towards his first game, probably a segment of a development game, and Juke is making good progress. "Keano (Michael Keane) we are monitoring, to make sure he's well. He's feeling good at the moment, but we'll see. "Beyond that we're in good shape physically and mentally." Tarkowski has responded well to being pitched into the side, helping see the side to a 2-0 with over Rotherham before the 1-0 win against Forest on his first start, and Dyche admitted his chance has come sooner than expected: "He wasn't brought in for the immediacy, although that is relevant. He was brought into a squad that we want to build and move forward, not just for this moment. "His chance has come quite quickly as it happens, and your chance can come through many different things, someone gets injured, a suspension, change of form, change of formation...it's important they're ready to take the chance. "I take great pride in how the players not in the side or on the periphery, work, they've been fantastic. "The will and demand they've got, when their time comes, they want to perform. "James has been a part of that. He's had a spell when he wasn't playing, and to step in as he has done has been fantastic for him and the group." Meanwhile, Lloyd Dyer is still building up his fitness before he is available for first team action, after joining as a free agent last Monday: "He's been training well. He hasn't played a lot of football, building up through the Christmas period and into his situation coming out of Watford, so we've got to make sure - I'm a great believer in the principle that you have to be ready to perform, not perform to be ready. "He's been doing some really good fitness work with the science team and he's building that into football work with us. "Then we'll get him a bit of a game, maybe a full game, and then take it from there, but he's going well, he's enjoying it."